The Journey towards Acceptance! – Motivational Mantras!! Quite often we struggle in our lives with people, situations and circumstances and always curse our luck for anything that goes wrong or precisely not according to us. More often we choose a path by ourselves but then get pissed off with the hurdles that come along on that path. We all are familiar with the famous quote “the road to success is always under construction” but do we ever see those hurdles on our path as those building blocks that will lead to construction? Do we ever realize that the hurdles we face are actually making us and not breaking us? Do we ever accept the hurdles as the growth incubators and not the hurdles? I feel we don’t. Spending almost two months now in the state of Bihar, where I never thought I would ever be in my life has triggered the thought and importance of accepting things in lives. I come from a city where trains are taken only when you’re travelling to some far of place. Also, you can easily accommodate yourself in a general dabba because people prefer road trips than train journeys. Here, after reaching Bihar I was travelling local for the first time in a train to reach another district called Jamui which is about 90kms away from Jamalpur, the place I am currently living in. I was very excited to travel for the first time in a train to reach such a short distance. Walking with my colleague from office, I reached station. The moment we asked to one of the local person about the train, he said “Bhaagiye, gaadi khul gaya hai”. For a moment, I couldn’t understand what he meant. I thought that one of the compartment of the train might have got detached from another to which he is referring khul gaya hai. But my colleague told me to run as the train had started moving. We started running when another uncle said “Ab kya bhaagiyega, ab to gaadi speed pakad liya”. I could see the train moving slowly just in front of me and my colleague standing there holding the rod of the gate and calling me out. I was quite far and couldn’t catch it. Yes, I missed my train, the very first local train about which I was excited like anything. I felt a bit bad and sorry too that because of me, even my colleague had to miss it. We checked for the next train and it had to be at 8 pm. We walked back to office and reached the station again at 7:45pm. Then we boarded on train and I easily found a place to sit. It was a bit surprising as I was expecting the train to be crowded as hell but this number of people was decent. I thought, local trains might not be that crowdie then. We then had to change the train from Kiul station to reach Jamui. 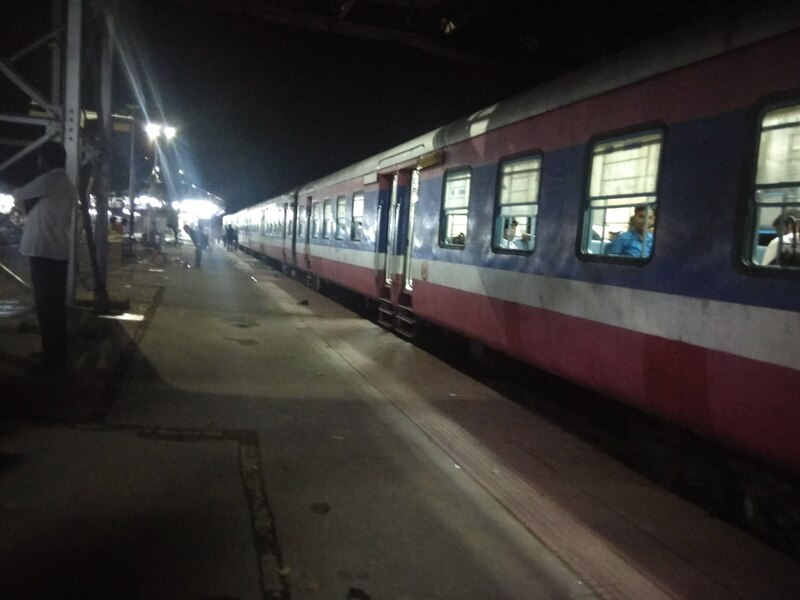 We went to the inquiry compartment at the platform and got to know that the only train that will take us to Jamui is late by two and a half hours. Now, I was almost pissed. I was already tired working whole day and now had to wait at the platform for almost three hours. We sat there and started sharing little little moments of our lives. We kept on talking and hours passed like that. I was sleepy and couldn’t wait more but I had no choice. Finally we heard the announcement of another train that will pass by the same route and the train we were waiting for was another half an hour late. We decided to board on this train and in a moment did the same. A sleeper cell it was where I was not even able to find a centimeter square feet to put my feet. Also, people had turned the lights off as it was sleeping time. I saw that an uncle on the lower birth who was snoring lying down in sleep had kept his legs on the window grill, leaving a bit of space which I could occupy to be seated. I immediately took that seat. After forty minutes of journey, we finally reached the station. We ran to catch and auto and the place where this auto driver dropped us was half a kilometer away from the office we were going to. Now with a heavy backpack, I had to walk half a kilometer till the office. The moment I stepped into the office, I felt like reaching heaven as I would have just given up if I would have to walk a centimeter more. I felt like crying at the moment but then controlled myself. I went inside the room I was given to accommodate in for my few days stay there. A big family of mosquitoes welcomed me with their paternal and maternal relatives both. I was told about the mosquito net place in the cupboard, so I took it out. Now, I didn’t know where to tie the ropes of this net and had no energy left to even think about doing it. So, I just covered myself with that net and slept. After few minutes, I woke up again from my sleep and then thought of the whole day. I found myself bursting out into laughter thinking about all that happened in the day. I actually lived a day like never before. Now I was a bit delighted thinking of the proverb “never live the same day twice”. I thought this day might not come again, but what a great experience it was. Yes. I’ve chosen to be here so I must accept what all comes along with it and I certainly need to change my outlook. I missed the train, but it was the first train I ever missed and that experience too was unique in its kind. I jumped into a crowded train, walked even when my energy was lost and slept covering me with the mosquito net. This was probably because, I somewhere accepted the situation and when I accepted it completely after reaching my destination, I was delighted with the experience I had. This is something I feel we all need to work on. Accepting a situation changes the whole course of experience and suddenly transforms all the fears and sorrows into some beautiful experiences. These experiences might never be lived again but can surely be recognized to bring a smile on your face and rejoice your soul. Here, I am now accepting every situation I become a part of and it brings experiences of its own kind to me. I now travel in local trains admiring the beauty of nature, talking to children in the train. I go for field visits in two wheelers hugging the winds every time, capturing the serene beauty on my phone and sometimes trying to ride the bike. I live alone but no more feel lonely as I involve myself in doing few crazy things apart from my work. I wait every single day for sunset that is just beautiful at this place. I am more into the youth I am working for here than I was in the first month. The most beautiful part of all these things is, I get all the love back too when I feel happy about these things, admire them and love them. This is all becoming more precious as I am becoming more accepting in my life. Everything comes with the good and the bad. But the moment we accept a situation, some of our bad transforms into good and when they mix with the existing goods, good dominates the bad by giving us a beautiful experience. It is all up to us, how we feel about a situation that occurs to us, how we respond to it and what we take from it. I feel the eternal motivation is hard to find, but it is easy to create every day one”.